Selling Price is after any Rebates if applicable. 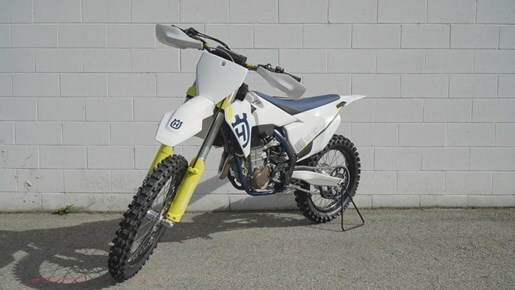 2019 Husqvarna® FC 450 MASTERSTROKE The pinnacle of Husqvarna motocross, the FC 450 uses advanced engineering techniques to not only draw 63 hp from the 450cc motor, but also position the engine closer to the centre of gravity to vastly improve handling and manoeuvrability. The addition of launch control means perfect acceleration off the line, while class-leading ergonomics and traction control keep the rider in full control. Features may include: Powerful engine A new SOHC cylinder head makes for a more compact design, while being 15 mm lower and 500 g lighter. As a result, the camshaft is now closer to the centre of gravity, significantly improving handling while shorter valve timing improves bottom end performance and responsiveness from the 63 hp powerplant. Gearbox A new lightweight 5-speed gearbox produced by PANKL Racing Systems ensures the highest level of durability and reliability. The gear lever also features a unique design that prevents dirt build-up and keeps the lever tip in its original position, even in the toughest conditions, while an advanced gear sensor selects the ideal engine map for each gear. Lightweight frame Hydroformed, laser cut and robot-welded, the frames featured in Husqvarna Motorcycles are expertly engineered with calculated parameters of flex. As such, the frame features an increase in longitudinal rigidity resulting in improved rider feedback, energy absorption and straight-line stability. Additionally, the 4-stroke frame now features new brackets for mounting the skid plate available in the accessories catalogue. Carbon fibre subframe The use of carbon fiber strips away weight, improving weight distribution and bringing weight closer to the center of gravity for precise handling. The composition of the material is 30% carbon fiber and the overall 3-piece construction is remarkably light but also very strong for an overall weight of 3.1 pounds. Additionally, a specific rigidity has been calculated in the component for optimal handling and rider ergonomics. Crankshaft The inertia produced by the crankshaft has been carefully calculated to deliver optimal traction and ride-ability from the powerful 450cc plant. Perfectly positioned, the component harnesses the rotating mass at the ideal center of gravity resulting in a lightweight and agile handling feel. A plain big end bearing comprising of two force-fitted bearing shells ensure maximum reliability and durability, guaranteeing long service intervals of 100 hours.